One of the most exotically beautiful of all marine fish is the lionfish with its vivid striped markings and large, elaborate fins. Equipped as it is with venomous spines, it is also one of the most deadly. However, since it is hardy, disease-resistant and easy to feed, it can be a good choice for an adventurous aquarist who is prepared to be careful. 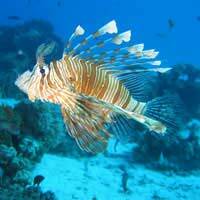 Lionfish can grow quite large, so make sure you have plenty of space for them. If you do, it's possible to keep several lionfish together, though each will defend its own territory within the aquarium. They can be kept with other kinds of fish of their own size and larger, but you should be aware that some species grow very fast. Naturally lazy, lionfish won't move around much except when feeding, so don't be worried if yours just lie around on the bottom all day. Use a soft substrate to avoid injury to their delicate skins. Even when hunting, they prefer to keep still and wait for live food to approach them, then lunge out to grab it. They enjoy eating smaller fish but should not be given these as a staple diet, as this can lead to obesity. Small invertebrates will also be accepted and, with a bit of patience, they can be persuaded to eat pieces of beef heart, fish fillet, prawns and worms. A varied diet will help to keep them contented and in good health. If they are reluctant to eat, try feeding them just after lights-out, as in the wild they are most active around dawn and dusk. Black Lionfish -The largest and most popular lionfish available, these fish can grow up to sixteen inches in length. They are among the most active and hardy species available but grow fast and need a lot of space. Antennata Lionfish -These fiery red fish get along well in community tanks so long as their companions are too big to eat. Naturally shy, they prefer a diet which is rich in shrimp. Devil Lionfish -Among the more delicate lionfish, these splendid red creatures need good quality water and a diet rich in crustaceans. Russell's Lionfish -These pale, elegant fish are notably active and are always looking for food, but they have a tendency to get fat. Dwarf Fuzzy Lionfish -Rarely exceeding six inches in length, these are very friendly and peaceful fish, as dramatic looking as any of their kin with three different colour varieties available. They're probably the easiest lionfish to keep. Dwarf Zebra Lionfish -These stunning fish are comparatively easy to keep, but do need an environment with plenty of hiding places. First, the good news: lionfish are not as poisonous as their scorpion fish relatives, and very few people die as a result of being stung by them. Next, the bad news: people do die from secondary infections if they don't treat the wounds properly, and even a minor wound will hurt for several days. Still want to keep lionfish? You'll be pleased to know that they're generally careful with their stings and will only use them if they feel threatened. Nevertheless, accidents happen. If you do get stung, immerse the affected area in water as hot as you can stand - this will take down the swelling, ease the pain and denature some of the poison - and call an ambulance. Even if the wound is minor you should seek professional medical help to avoid the risk of secondary infections. As a lionfish owner, you should also be sure to keep your tetanus injections up to date, since tetanus infection after a sting is a serious risk. Provided you're careful and patient with them, caring for lionfish is fairly simple, and they make fascinating additions to the aquarium. Besides their spectacular appearance, they're very personable and quite intelligent, and they live long enough to form a proper bond with their owners. They'll really add something special to your reef. Hi I would love to keep an atenata or zebra lionfish my tank is a 200 litre cube with a 60 litre sump. Is this large enough ? my lion fish has stopped eating for 4 days is this normal ? ?